Does the Vess Bottle Belong in the Bottle District? The Vess Bottle, viewed from the north. 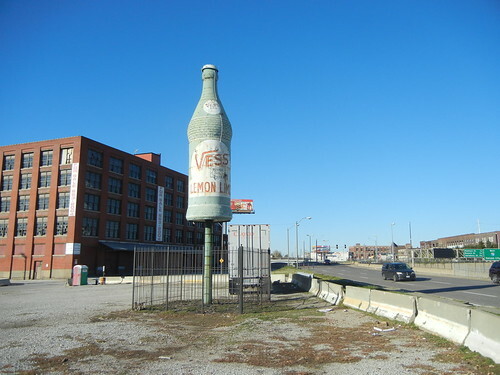 Now that the “Bottle District” — that mass of spread gravel north of our football stadium — is poised to become part of the Northside Regeneration project, perhaps it is time to evaluate the fate of the Vess bottle sign that gave the now-merged project its name. Dan McGuire of McGuire Moving and Storage, the longtime former occupant of a nearby historic warehouse building at Sixth and O’Fallon streets, invented the Bottle District trope in 2006 to market an ambitious mixed-use high-rise redevelopment project designed by architect Daniel Libeskind. The Libeskind plans are long gone, and now developers Larry Chapman and Paul J. McKee, Jr. are trying to market a now-cleared site between O’Fallon and Cole streets west of Broadway. What the bottle has to do with the new project is unclear. Treesh Neon fabricated the neon tubing on the sign. The bottle itself has only stood on a tiny fenced-off piece of land off of O’Fallon Street since 1989, when McGuire’s company installed it there. The sign actually comes from south St. Louis, and was moved to the current location after being found in storage. The Vess Soda Company commissioned the sign in 1953, and placed it on Gravois Avenue near Hampton Avenue. The impressive bottle was built 12′ tall on a 13′ post upon which it revolved. The maker of the steel bottle was the W.E.Caldwell Tank Company, which made the giant Brooks Catsup bottle in Collinsville (70’1” tall) as well as the Louisville baseball bat in Louisville, Kentucky (120′ tall). 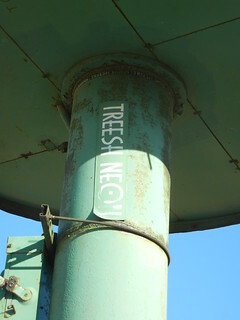 Treesh Neon Sign Company of East St. Louis, Illinois built the 600’ of neon tubing that illuminated the bottle in polychromatic splendor. 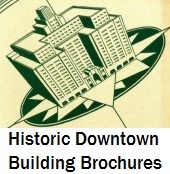 In 1990, the Heritage and Urban Design Agency aided the designation of the “Vess Advertising Device” as the city’s 120th City Landmark. (For shame, the city has only designated four additional City Landmarks since then, with one designation pending currently.) The designation might preclude relocation of the sign from its current site, but since the sign has not been in its historic location for 49 years a second move would not impact its integrity as a cultural resource. The Vess Bottle site is a wretched spot. Access comes from a dead-end stretch of O’Fallon Street, located right at a southbound-only leg of Broadway that serves less as a street than a traffic ramp. Alongside Broadway is another, unworthy mid-century structure: the elevated lanes of Interstate 70. While the Vess sign could be restored to delight many motorists, it is unlikely that even in the most ambitious Bottle District future it will ever get much pedestrian visitation. With the elevated highway lanes and the stadium as obstacles, the Bottle District will have a tough time being a walkable and connected area. Libeskindiana seemed a best-case plan, but perhaps my pessimism about the current prospect is unwarranted. The Vess Bottle site, looking north. Lots of cars. The Vess Bottle ought to be placed somewhere where people can access its glow at night. Relocating the Vess Bottle to a more attractive and accessible site would be good for the city. If the bottle stays in the “district,” it ought to be moved somewhere where there will be activity. If the developers can let the bottle go the way of the “Bottle District” conceit, which now is ambiguously merged with Northside Regeneration, then a more prominent location would be better. 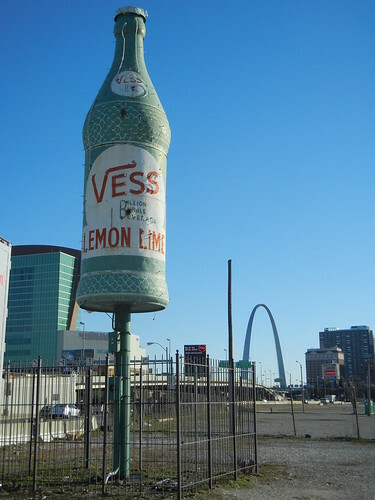 The Vess Bottle's appearance back when the neon was lit. Photograph courtesy of Modern STL. The Brain Drain Collective’s CityPulse proposal offers an instructive lead: light features should be tied to the city’s social life, and not remote artifacts for the motorists’ split-second gazes. The east end of Washington Avenue could use a placemarker, perhaps right where it meets the boulevard that hopefully will replace I-70’s elevated wall. Maybe the “bottle district” could open up at the Arch grounds and include a remake of the while corridor where the highway lanes have severed downtown and the riverfront since 1964. Of course, should the highway lanes fall, it is equally possible that the bottle is fine right where it is. Whatever happens, the bottle deserves a better setting. This entry was posted in Columbus Square, Downtown, Neon, Northside Regeneration. Bookmark the permalink. 2 Responses to Does the Vess Bottle Belong in the Bottle District? Any photos of the bottle in its original surroundings? No matter the location St. Louis planners do not know how to use landmarks effectively. A city that had its act together would couple the Vess Bottle with a transit center or other urban public space. Instead it is in nowhere land, and with McKee running the project, it is hard to believe anything will be different. Like a fountain, this sculptural bottle art should be featured. Here is a plaza with a fountain in Paris for comparison, http://en.wikipedia.org/wiki/Fontaine_Saint-Michel. The Vess Bottle is not of the same magnitude as Saint Michel, but what are the possibilities? (It could be) In St. Louis we never know those possibilities. They are never part of the official government/media “dialog” Any discussions of this type are usually reserved for Preservation Research and a few other blogs..
Move it if necessary. Especially if it was not its original location. I agree 100 per cent it needs a better setting. The neon is great, I had no idea, so much the better for any new location.